If the current drought has an upside, it is that the Great Lakes may get some relief from algae blooms that form the “green slime” that’s been getting steadily worse in recent years. That’s because this year’s drought conditions are expected to dramatically reduced the number and intensity of heavy spring rains that wash farm field fertilizers into agricultural watersheds that drain into the lakes. 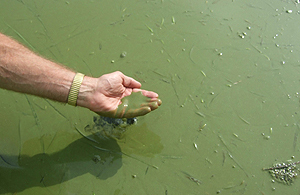 Green Slime that plagues Great Lakes results mainly from fertilizers used by big agriculture. Half a century ago, the nation and states around the lakes legislated an end to the wholesale dumping of sewage and industrial waste in the lakes. Before that legislation, algae blooms, which result from the mixing of such wastes as phosphorous, manure, and other nutrients into the warm lake waters, were common. The federal Clean Water Act of 1972 quickly made things better, and the lakes enjoyed several decades without green slime. Now the slime is back again, worse than ever in some places. The cure is difficult, although there is no doubt that it is simply a matter of preventing nutrients, especially phosphorous, from entering the lakes. This sounds easy but it is a thorny political problem, especially with a congress reluctant to regulate the activities of business. These are problems fixed by the Clean Water Act that now need to be fixed again. More information from Circle of Blue.